John and I became parents a little over 7 months ago. It’s the most amazing thing I’ve ever done, but also the most challenging and exhausting. So a holiday was just what we needed, our first one as a family. After a few attempts at packing the car to fit all our new baby stuff, off we drove to Suffolk. If you are a regular reader of this site (welcome if not!) then you will know that John and I have a strange fascination with roast lunches. 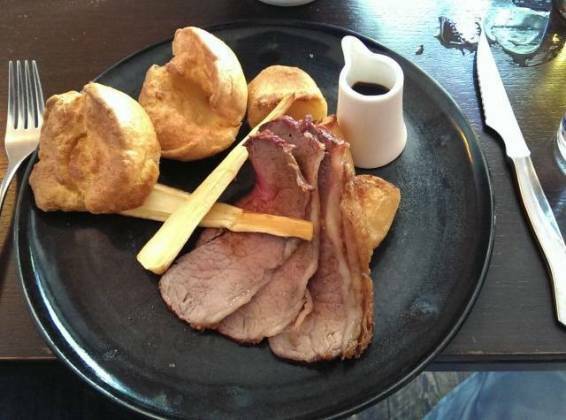 So, what holiday of ours would be complete without a Sunday roast? John did a bit of research and came up with a shortlist of 3. All sounded good, but this one stood out to both of us as something interesting to try so John went ahead and booked us a table for the last day of our trip. Fantastic, we were met at the door as we arrived and shown to our table. Staff were really friendly; a couple of people had dogs, the animals were shown plenty of attention by the team and given biscuits! They had friendly chit chat with everyone, without being invasive, and remembered regulars (someone was shown to their usual table). We arrived quite early and were therefore the only people in our section of the restaurant for a short while. As more people were shown in, we realised how quiet it was and so the normal noises that our baby was making seemed amplified. We felt quite conscious that other people may not appreciate a little extra noise even though we weren’t made to feel uncomfortable in any way by the staff. When we asked if we could sit outside for our desserts (so our baby would be free to make some noise!) they were obliging. It did mean that we left our napkins and tableware inside. There was another couple with a dog outside (another with a large one inside the main part of the restaurant), and a member of staff was quite attentive to the dog (much more so than our baby, I noted with amusement). In fact, there are notes inside that limit numbers of children to 1 per table, stating they’re a restaurant not a creche. We knew were going to have dessert so decided to share a starter, and it turned out to be a good decision. 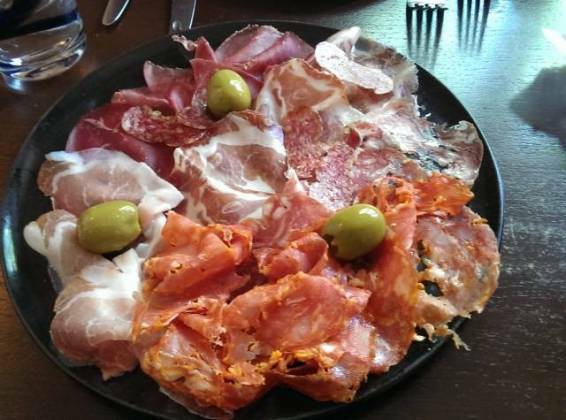 We went for the cured meat platter with olives, which turned out to be a very generous size. It was delicious and we both enjoyed it. 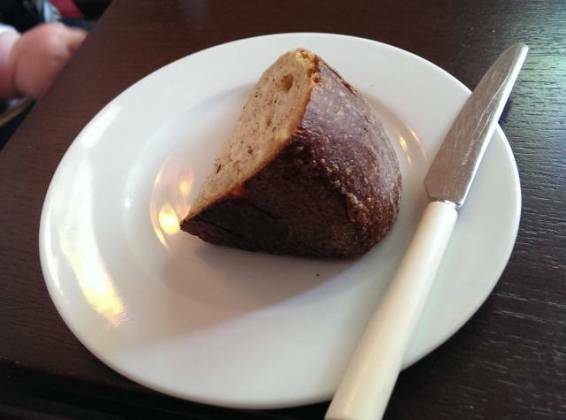 Also, we were served a beautiful and large chunk bread to nibble on. 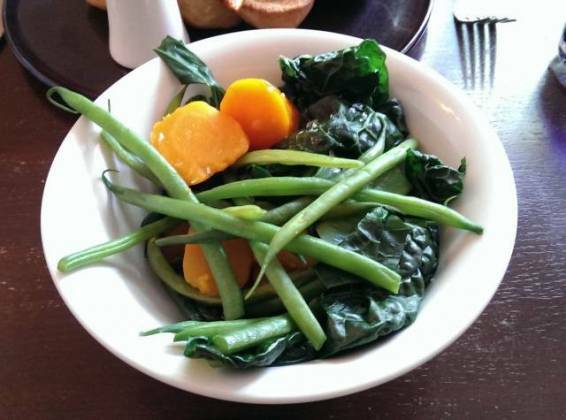 Green beans, runner beans (I only had one piece), greens (cooked perfectly), carrots (overdone for our tastes but can appreciate a lot of people like softer carrots), roast parsnips. Good quality and quantity. 2 yorkshires each; really nice texture. A bit denser than some, just the way I like them (some I think are too light and crispy). 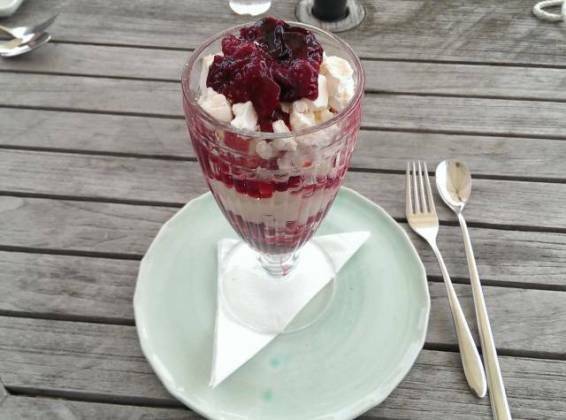 I had frangipane tart, John had a meringue sundae. I was quite disappointed by my dessert, I was expecting someone a little more fancy to be honest. It was nice enough, a little plain. John had the sundae and really enjoyed it. 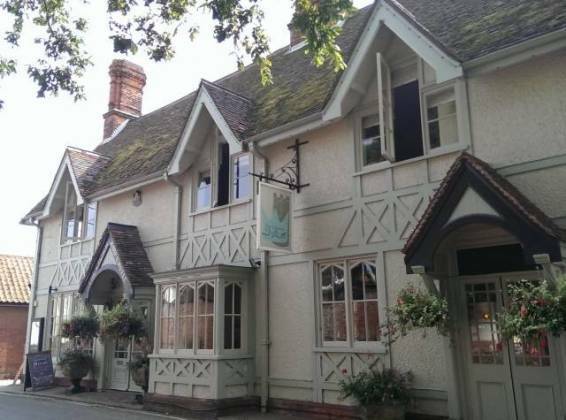 The service here was excellent, it was a nice welcome and we were looked after throughout the meal. The venue was quite plush, with large paintings on the wall and wine bottles on the window sills. We did feel this was more a restaurant for “dignified grown-ups” rather than a couple with a young baby – dogs were made most welcome (in the restaurant too). 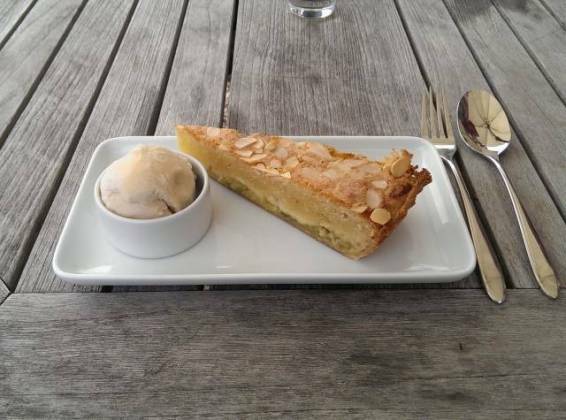 The food, on the most part, was very good – especially the starter and the roast potatoes, but the frangipane dessert (at £7.50! )was a bit disappointing. Lastly, the location – amazing to be able to walk out of the restaurant and have the view of Orford Castle! So, a nice place to go for grown ups who have a dog. Not the place to go if you are watching the pennies.